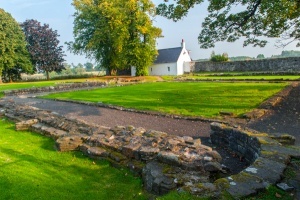 The remains of this great 12th century Augustinian abbey stand in a riverside setting just off the road between Stirling and Alloa. 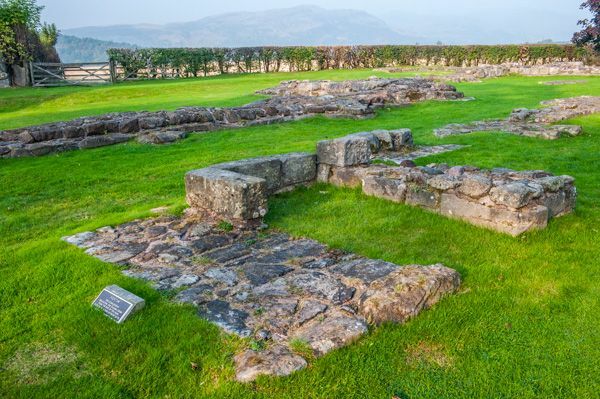 Founded by a king and burial place of another, Cambuskenneth has played host to some of the most dramatic events in Scottish history. In 1140 King David I founded an abbey of Arrouaisian canons beside the River Forth, just over a mile from his royal castle at Stirling. The abbey later passed to the more prestigious Augustinian order of monks. 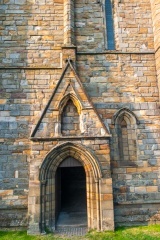 Edward I stayed at the abbey in 1303 during one of his numerous forays into Scotland. In 1308 Robert the Bruce, Edward's great enemy, received oaths of fealty from leading nobles over the high altar here. After Bruce's victory at Bannockburn in 1314 he held a Parliament at Cambuskenneth, and in 1326 a gathering of all the nobility, clergy, and even leading burgesses gathered at Cambuskenneth to swear loyalty to Robert's son David. The 1328 gathering was the first Parliament in Scottish history where burgesses are specifically mentioned. Throughout King David's reign both English and Scottish armies periodically ransacked the abbey. 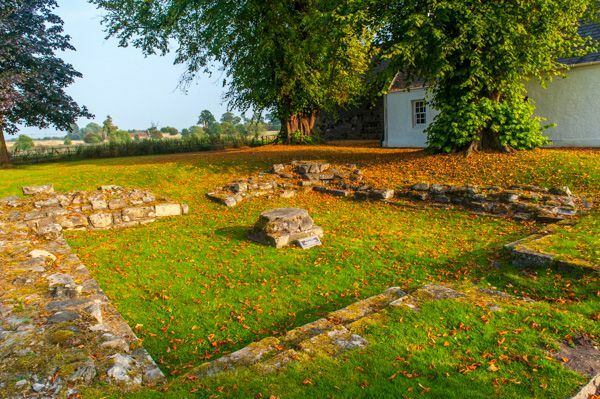 The most famous episode in the history of Cambuskenneth Abbey came in 1488, when the armies of James III met the supporters of his son, the future James IV, at the Battle of Sauchieburn a short distance to the east. 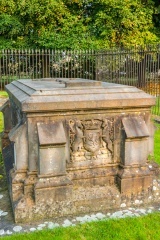 The unfortunate James III was murdered prior to the battle, and his body brought to Cambuskenneth. There he was buried by the high altar, with his queen, Margaret of Denmark, who had died 2 years before. 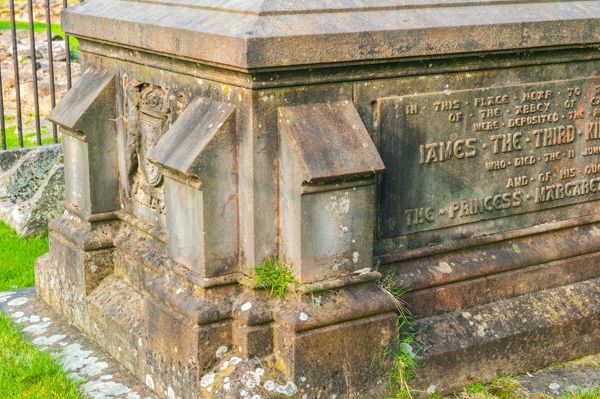 In 1864 skeletons believed to be those of the royal couple were found near the altar, buried in a coffin of oak beneath a heavy slab of limestone.. Queen Victoria ordered the bones to be reburied with ceremony beneath an elegantly carved altar tomb in the ruined choir. The tomb is quite easily found, standing as it does behind a high iron railing, at the far end of the abbey site from the campanile. Cambuskenneth suffered from the effects of religious reform that swept Scotland in the 16th century. 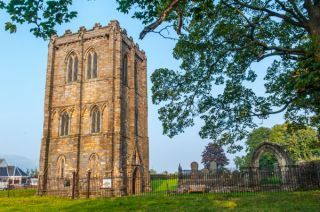 By 1560 it was recorded as a ruin, and the Earl of Mar is said to have robbed stones from the abbey to build his townhouse of Mar's Wark in Stirling. 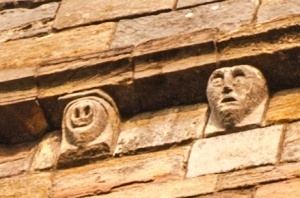 Fragments of carved stone from the abbey can also be found in the nearby Church of the Holy Rude. The abbey was built in a loop of the river, protected on three sides by water and on the fourth by a bank and ditch. Within this precinct was a monastic church with an unusual detached bell tower, or campanile. It is this bell tower that is the most obvious surviving feature of the medieval monastery. Why did the tower survive? It seems odd that the rest of the abbey should be so ruinous, yet the bell tower looks remarkably complete. Why was it not pulled down at the Reformation? The answer may be that the tower served as a useful lookout over the relatively flat riverside plain. Most of the surviving buildings date to the 13th century. Unfortunately most of the abbey church has been destroyed, leaving only foundation walls and a solitary doorway arch that once gave entry to the west end of the church. You can see the layout of the cloister to the south of the church. 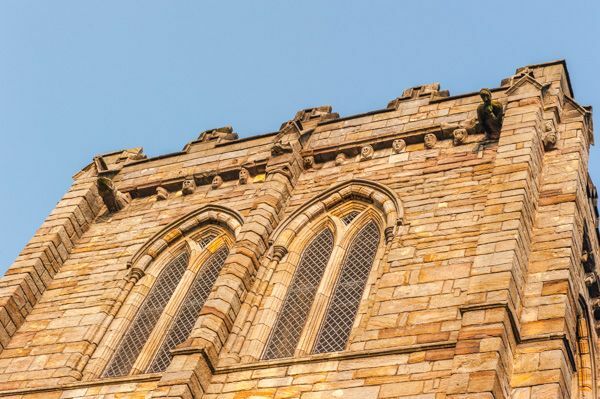 The most striking feature, however, is the bell tower, which is remarkably complete, and features a wonderful series of grotesque carvings near the roofline. The tower is over 20 metres high and is the only example in Scotland of a monastic campanile. The original abbey church had a central bell tower, but that collapsed in 1378, leaving the campanile to fulfil all bell-ringing functions. 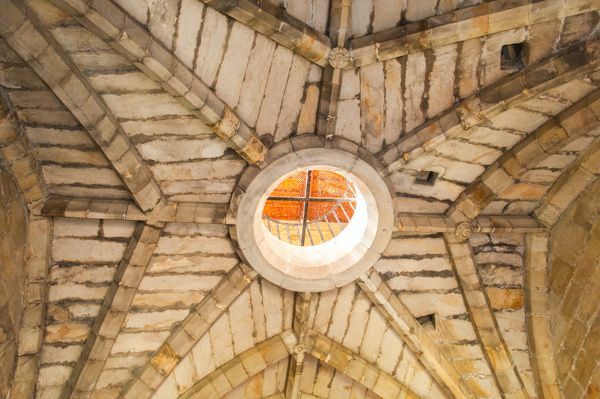 You can go inside the campanile, and see the excellent vaulting at ground floor level. 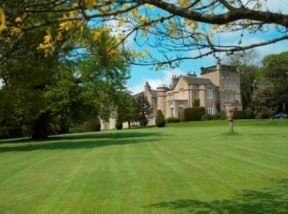 The upper floors can be viewed by special arrangement with Historic Scotland. 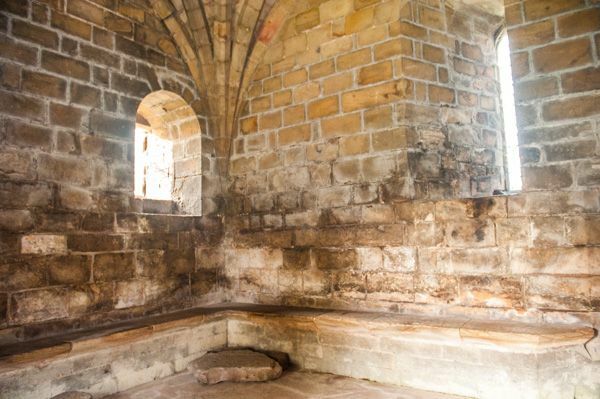 There are several useful information panels and various parts of the abbey ruins are signposted, which helps give a sense of how the abbey was laid out. You can also get excellent views to the Wallace Monument from the abbey site. 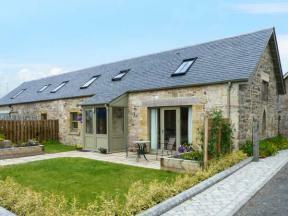 This delightful, semi-detached barn conversion sits next to the owner's home and plant nursery in Plean near Stirling, and sleeps four people in two bedrooms. 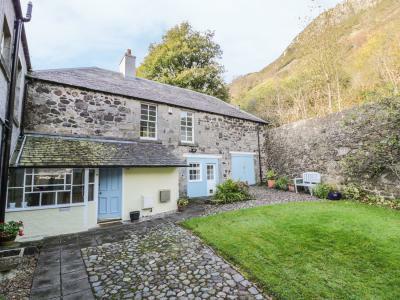 A semi-detached former coach house near to Stirling in Scotland, it can sleep four people in two bedrooms.